We’re getting two new playable world zones, a megadungeon, and a raid in patch 8.2 that will continue the story of Battle for Azeroth. If you liked the aesthetic of Vashj’ir but hated the mechanics, you’re in luck. The patch will have us delving deep into Azshara’s Naga city as well as heading to a Gnome-themed island. Even better, you’ll be able to fly everywhere. Let’s take a look at what we’ll find in these new zones. This is where Azshara has made her home all these millennia. 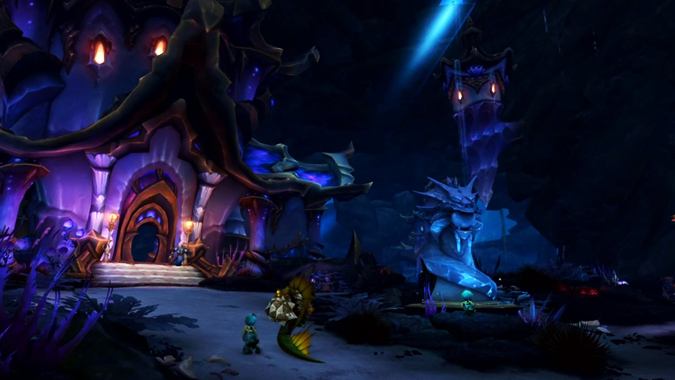 Nazjatar functions both as the name of Queen Azshara’s empire as well as the capital city of that empire. It lies beneath the Great Sea, in the ruins of what once was Azshara’s favorite city: Zin-Azshari, which was destroyed in the Great Sundering. In patch 8.2, Azshara and the Naga lure us out there, where the ocean recedes to drop us in the middle of the city. 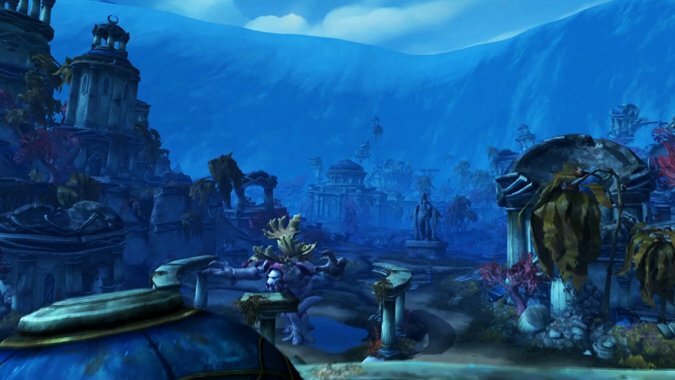 They city is surrounded by waterfalls, so that we get the aesthetic of an underwater zone without the commonly complained-about underwater pitfalls that plagued Vashj’ir. In Nazjatar, we’ll encounter allies who hate the Naga and help us fight back. For Alliance this is the Ankuran and for the Horde it’s the Unshackled, but regardless of the factions, players will be building a new faction hub, which seems similar to our old Warlords garrisons. From there, we’ll strike out at the Naga and Queen Azshara, unlocking new World Quests and hunting down new rares. The bodyguard system will return with a choice of three combat allies to level up, unlocking new abilities and cosmetic rewards. Once we help arm our new allies, the story culminates in attacking Azshara on her home turf. The next raid tier will technically be coming with the new patch, though it won’t release until we play through the full story. Here we’ll go on the offensive, finally taking on Queen Azshara in her home palace. The raid will feature eight bosses, including one underwater boss. We don’t have much detailed information about the raid yet, but we do know that the final boss is Azshara herself — and the results of the fight could have repercussions that change the future of Azeroth. 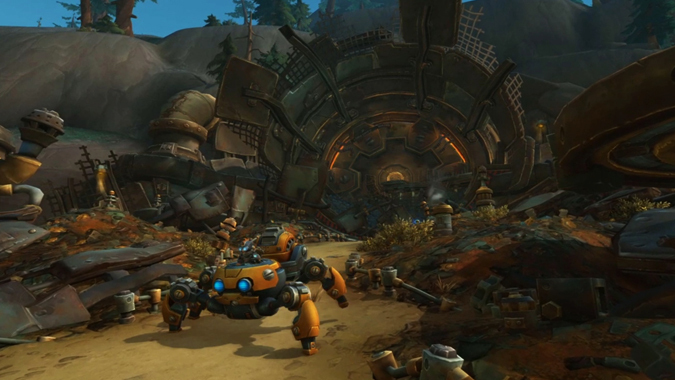 The other open-world zone is Mechagon, an ancient Gnome city that had been lost to time. It’s located on an unexplored island, which we find when we receive a mysterious radio transmission asking for help. Our goal is to help rebuild the island and eventually take down King Mechagon before he can succeed in his plan to turn everyone into robots. The zone features some mechanics that will remind you of previous expansions. Mechagon functions like Mists of Pandaria’s Timeless Isle, with open exploration at your own pace, as well as rare elites that have interesting mechanics and unique rewards. Three NPCs show up each day, like the inn at your Warlords garrison, with different daily quests that affect spawns in the zone. Mechagon is meant to be all about building and tinkering, so you can find and build things such as turrets to help kill rares. Some projects even have lasting cosmetic rewards — like building a mechanical cat with different paint schemes or even a robot that can become a spiderbot mount. The new dungeon is a double-sized 8-boss megadungeon where we go to heroically take down a death robot. The dungeon starts by entering through a trash compactor, because apparently doors are for losers. Because everyone hates us wherever we go, the city isn’t exactly pleased to see us and everything is weaponized against us. What really makes this dungeon interesting, besides its size, is the loot. We’ll pick up a special trinket through questing that we can later upgrade through other quests and from Mechagon dungeon runs. It’s customizable by mixing and matching different “punch card” sockets that we can pick up, which have different effects. All of this will be going up on the PTR next week if you want to explore everything yourself or leave feedback regarding your favorite parts.